Davarpanah, S., Karimian, R., Piri, F. (2015). Synthesis of Copper (II) Oxide (CuO) Nanoparticles and Its Application as Gas Sensor. Journal of Applied Biotechnology Reports, 2(4), 329-332. Seyed Javad Davarpanah; Ramin Karimian; Farideh Piri. "Synthesis of Copper (II) Oxide (CuO) Nanoparticles and Its Application as Gas Sensor". 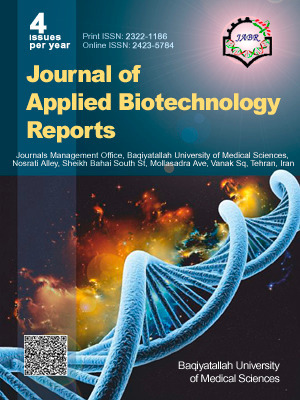 Journal of Applied Biotechnology Reports, 2, 4, 2015, 329-332. Davarpanah, S., Karimian, R., Piri, F. (2015). 'Synthesis of Copper (II) Oxide (CuO) Nanoparticles and Its Application as Gas Sensor', Journal of Applied Biotechnology Reports, 2(4), pp. 329-332. Davarpanah, S., Karimian, R., Piri, F. Synthesis of Copper (II) Oxide (CuO) Nanoparticles and Its Application as Gas Sensor. Journal of Applied Biotechnology Reports, 2015; 2(4): 329-332. Copper sulfate was used as a precursor to prepare CuO nanoparticles in reverse micelles (o/w microemulsion). This is a technique which allows the preparation of ultrafine metal oxide nanoparticles within the size ranging from 50 to 60 nm. The preparation of nano copper (II) oxide studied was investigated in the inverse microemulsion system. Therefore the nucleation of metal particles proceeds in the water capsules of the microemulsion. Tween 80 was added as surfactant. The products were characterized by X-ray diffraction (XRD), scanning electron microscopy (SEM) and transmission electron microscopy (TEM). The study provides a simple and efficient route to synthesize CuO nanoparticles at room temperature.